After some leaks and rumors, Samsung finally launched the Samsung Galaxy A80 flagship device with some unique features. The South-Korean smartphone manufacturer announced this device in China on 10th April 2019 and will soon be released globally. This Samsung has launched so many devices with new models like A-series, M-series, Galaxy S10-series including a smartwatch. The device comes with a full view display with no notch at all. As we already have seen the camera cut-out on Samsung Galaxy S10 devices. But this model has a rotating camera with a slider module for a selfie as well. The Super AMOLED Full HD+ display along with Dolby Atmos audio integration will come in handy. It runs on Android Pie based on One UI out-of-the-box. The best part of this rotating camera is that we have already seen this type of camera from Oppo N11 back in 2013. That time it has a manual rotating system. But now, it comes with the rotating motorized mechanism. 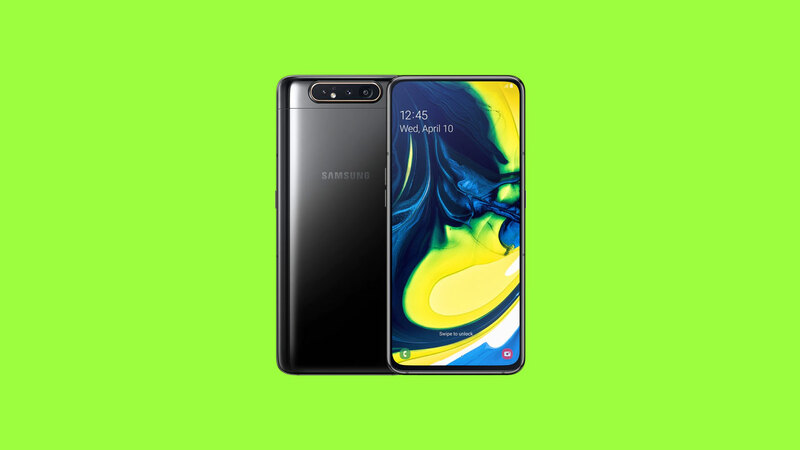 The 4G dual-SIM packed Samsung Galaxy A80 comes with a huge 6.7-inch Full HD+ Super AMOLED New Infinity Display with a 20:9 aspect ratio and no notch with a resolution of 1080 x 2400 pixels. The device is powered by the newly released octa-core Qualcomm Snapdragon 730G SoC, coupled with 8GB of RAM. The smartphone sports an in-display fingerprint scanner and comes with a 128GB of internal storage as well. There is no external storage option available. Coming to the highlighted feature of this smartphone, the rotating camera sports a triple camera module. It features a 48MP primary sensor (f/2.0), a secondary 8MP with an ultra wide-angle lens (123 degrees) and an f/2.2 aperture lens. It does have a 3D depth camera as well. The advanced IR sensor also attached to the lens. for the selfie mode, the three camera-module automatically pops-up and rotate to the front. The speed of rotating and poping-out camera delay is quite negligible. The Galaxy A80 includes Super Steady video mode, Scene Optimizer with 30 scenes detection, and Flaw Detection as well. The Galaxy A80 packs a 3,700 mAh battery with 25W Super-Fast Charging support. It features all the necessary connectivity options and sensors as well. The Samsung Galaxy A80 price has been revealed at EURO 649 (approx Rs. 50,450). The smartphone will be available in Angel Gold, Ghost White, and Phantom Black color options. The Samsung Galaxy A80 will go on sale from May 29 in markets across Asia, China, Europe, Australia, Middle East, New Zealand, Hong Kong, and Russia. The Galaxy A80 may launch in a coming few months. There is no confirmation about the Indian price tag as well. However, it’s expected to be around the similar price of the European market.